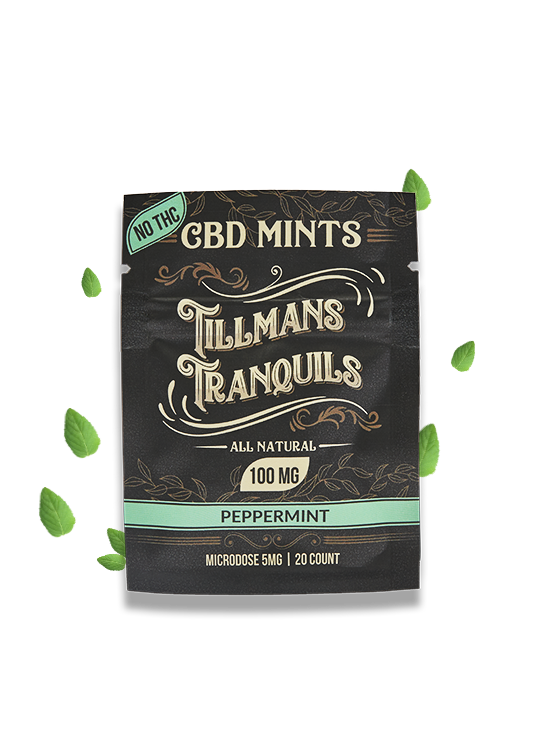 Tillman's Tranquils > What Does CBD Taste Like? As public awareness surrounding the benefits of medical marijuana and CBD (cannabidiol) grows, so does the variety of available CBD products. One of the most common questions people have is, what does CBD taste like? This is because the type of CBD product you ultimately choose may depend a lot on whether you enjoy the natural taste of CBD. The uniqueness of the taste of CBD may surprise – or disappoint – you. What you will be tasting is the combination of the plant’s organic compounds, which include chlorophyll, cannabinoids, and terpenes. Some consumers like the taste of CBD, describing it as an “earthy”, “grassy”, “peaty” taste – and with a hint of “nuttiness”, some even claim. To call a spade a “spade”, CBD tastes like cannabis, period. For some CBD users, the taste is definitely an acquired one. If you haven’t previously smoked marijuana, it will definitely be a novel taste to you. Of course, there are also people who straight up dislike the taste. What CBD product you purchase and how it is made will determine how much of this natural CBD flavor you will be able to taste. The most common ways to take CBD are to eat it (in capsule form or incorporated into a CBD infused “edible” such as a candy or baked good) or to administer a CBD oil sublingually, which is when you put drops under your tongue to be absorbed through the mucous membrane. When you ingest CBD oil, it will definitely have thattaste, even if citrus or other flavors have been added in by the manufacturer. It is possible to add drops of CBD oil to a beverage (coffee or smoothie) or into food (fruit, frozen yogurt, soup) to mask its flavor, but this is not an ideal delivery method for this form of CBD. CBD tinctures are also available; again, how they taste will depend on their concentration and how they are made. Whether you have a CBD isolate or a full spectrum (also known as “whole plant”) CBD product will also affect how much of the CBD you can taste. CBD isolate is an extracted, purified form of CBD without the other cannabinoids (such as THC). Full spectrum CBD contains trace amounts of THC as well as the other cannabinoids. Consumers have described the taste of CBD isolate as having an earthy but slightly more citrus – cherry, even – flavor, whereas full spectrum CBD is more like the classic CBD taste. In other words, if you are planning to smoke your CBD, you should pretty much be resigned to tasting it. This is where we should introduce you to our CBD Mints. Our mints are the perfect solution to microdosing. Microdosing is a way to keep CBD levels up, while on the go, throughout the day. Our mints have great shelf life and are heat resistant due to our outer coating. Read all about the highlights here. In addition – they taste amazing. Check out a single pack or maybe 4, but if you are interested in consuming CBD more longer term, how about a box? For people taking CBD as part of a pain management regimen, CBD topicals, like balms and salves, are applied directly to the ailing body part for absorption into the skin, muscles and joints. CBD vape cartridges are also on the market and have a variety of “flavors”. Depending on whether the manufacturer uses hemp seed oil or another oil as the base, the CBD taste may still be detectable. Sadly, many people who use CBD vape cartridges have described the taste as somewhere between artificial cherry…and bedding for rodents. Needless to say, if you are smoking your CBD – in cannabis strains that have up to a ratio of 20:1 CBD to TCH – you are going to taste the unique, impactful herbiness of the CBD, which some have likened to marijuana minus some of the fruitiness. If you are one of the people who actually likes the taste of CBD (and doesn’t mind smelling like cannabis), the full flower form is for you. Your best bet when it comes to “masking” the taste of CBD may be to enjoy CBD-infused edibles. What better way to take your CBD than in the form of foods you already like? For people with a sweet tooth, the types of CBD-infused edibles out there are limited only by the imagination. Depending on the company and its stock, you can find baked items such as brownies, cookies, puffed rice treats, granola bars, and muffins/cupcakes, and all sorts of candy — including hard candy, chocolate, fudge, and gummies. While it is possible to add drops of CBD oil into food, you may want to have a less fussy way to enjoy your CBD. Not only would you have to add a substance with an oily, runny or viscous consistency to an otherwise, perfectly decent treat, but you may also have to calculate appropriate dosages and make sure you are careful not to spill your CBD oil. In addition, while manually adding CBD oil to your food may be fine in the comfort of your own home, it may raise some eyebrows in the employee lunchroom or subway car. If the concentration of CBD in your edible is high, you may still taste that slightly bitter earthiness. Moreover, products like baked goods and candy often come in a size that requires you to divide them into appropriately dosed pieces. Depending on how strong the concentration is and how easy it is to divide the edible correctly, you may notice the effects of inconsistent dosing. These are a few reasons why for some consumers, CBD mints are ideal. Not only is the mint flavor strong enough to mask the taste of CBD, but there is no downside to having a clean, fresh feeling in your mouth. Mints – like Tillmans Tranquils – are also convenient in terms of portability and dosage. Since they are already “microdose” sized, you don’t have to worry about carefully cutting up edibles into perfect pieces. Instead of carrying around chunks of a food product, mints are a much more discreet way to keep your CBD on you. Whenever you need a dose, you just pop one into your mouth — no one is going to look twice. 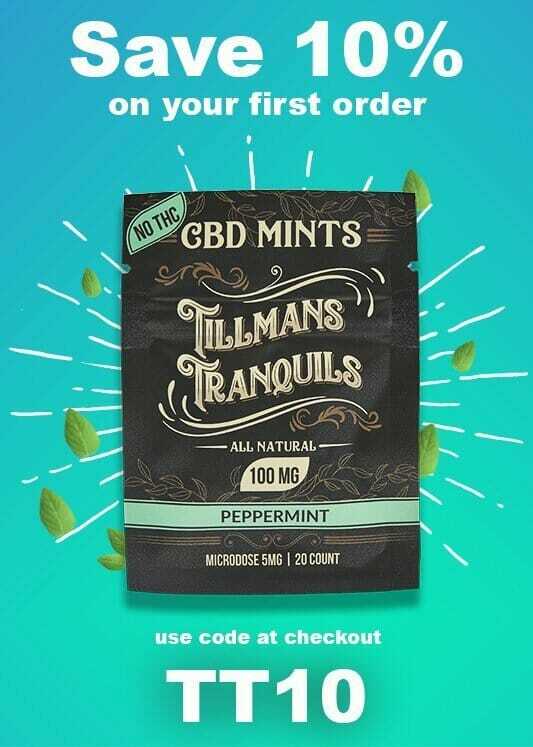 Unlike some manufacturers/retailers of CBD products, Tillmans derives the CBD in its mints from hemp, not cannabis, so Tillmans Tranquils do not contain THC. For people who want to benefit from CBD without the fear of becoming “high”, Tillmans Tranquils are their go-to source for CBD.